Defibtech AED : Medical Thermometers : ECG Equipment : EKG Machines : Pulse OX : Ambulatory Blood Pressure : Fetal Dopplers : Schiller Monitors : Medical Device Depot, Inc.
An AED in your office can increase the chance of survival of sudden cardiac arrest by up to 70%! Sudden cardiac arrest kills 400,000 Americans each year. Sudden cardiac arrest is the #1 workplace killer in the country. Currently only 3-5% of people survive sudden cardiac arrest. When sudden cardiac arrest occurs, every minute that passes without defibrillation lowers a person's chance of survival by 7-10%. National EMS response times average 6-12 minutes to respond. AED-View guides the user with video & audio which correspond to the users actions. Training videos built right into the device break down language barriers. Noisy environments are not an issue. 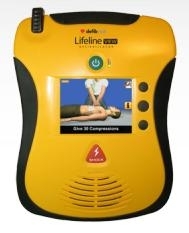 Built to military specs, this AED provides superior durability. For more information on our products, call 877-646-3300 or visit Medical Device Depot.